Tramlines recently released the full schedule for the weekend (24-26 July), detailing the running order for all 200 artists on its 2015 bill. New for this year, Tramlines' printed programmes are completely free and have been distributed around Sheffield and other key cities. Tramlines is one of the UK’s biggest inner-city festivals where, for one weekend, 100,000 people descend upon Sheffield to turn the city centre into one huge festival site. Now in its seventh year, Tramlines continues to bring legendary acts alongside breaking new talent to its stages. 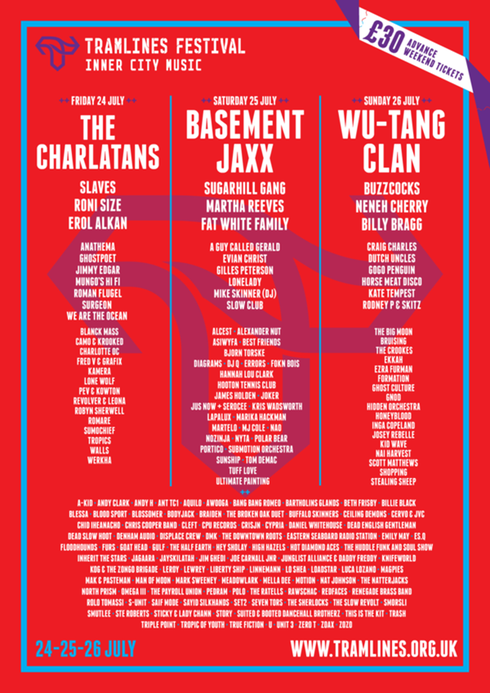 Headliners for 2015 include The Charlatans, Basement Jaxx and Wu-Tang Clan, with support from the likes of Billy Bragg, Buzzcocks, Martha Reeves, Neneh Cherry and The Sugarhill Gang. Venues on the festival circuit include the o2 Academy, the Leadmill, The Night Kitchen, the Cathedral, Foundry, Fusion, and The Octagon Centre, The Harley, Hope Works, Millennium Gallery, City Hall, Queens Social Club and Yellow Arch Studios. Outdoor stages include the Main Stage at Ponderosa Park, the Exposed In Session Stage on Devonshire Green and The Folk Forest in Endcliffe Park.